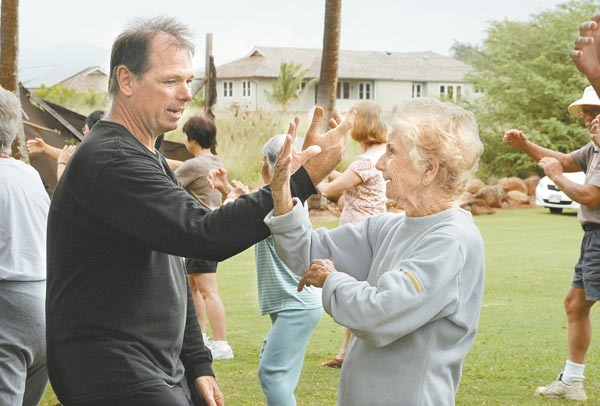 Qigong and Taiji are a way to total health, strengthening your body mind and spirit. The Path that leads to the Great Way is simple, it’s just overlooked by most people as if it wasn’t even there. The first step is to discover that there is if fact a way….once you find it you will never leave the path. The greatest treasure in the universe is already inside of you. You are made from little bits of Heaven and Earth, literally! Taiji is about the greatest treasure in the universe, your energy. On a basic level there are layers of energy like the proverbial onion. Starting on the outside there is the physical You. As we go deeper next we encounter the mental/thinking You. Deeper still we find there is the emotional You. At the center, there is your spirit; the core You. To the Taoists a “real” human being has all these energies in balance with each other. Too much energy or too little energy in any one aspect of You and the imbalance will lead to dis-harmony. Dis-harmony leads to a poor quality of life….. Almost all sickness comes from unbalanced energy that leads to dis-harmony within. Great joy comes from balance and harmony within. Obviously there is a huge difference between “sickness” and “great joy”. In my classes we start with the first thing; your body, learning to align and relax it. Next we learn how to dissolve the mind into the body by integrating the two. Learning this art will bring a new understanding to life and calm your emotional states opening up a spiritual awakening that can not be described. Nothing can compare to knowing that you are a divine creation. Whats it all about? Those words tie in so wonderfully with the last sentence.We are all divine creations living in a divine creation. Thank you God of many names!